In a large bowl, combine the lime juice and zest, cayenne pepper, rice wine vinegar and honey. Whisk in the olive oil and season with salt and pepper to taste. 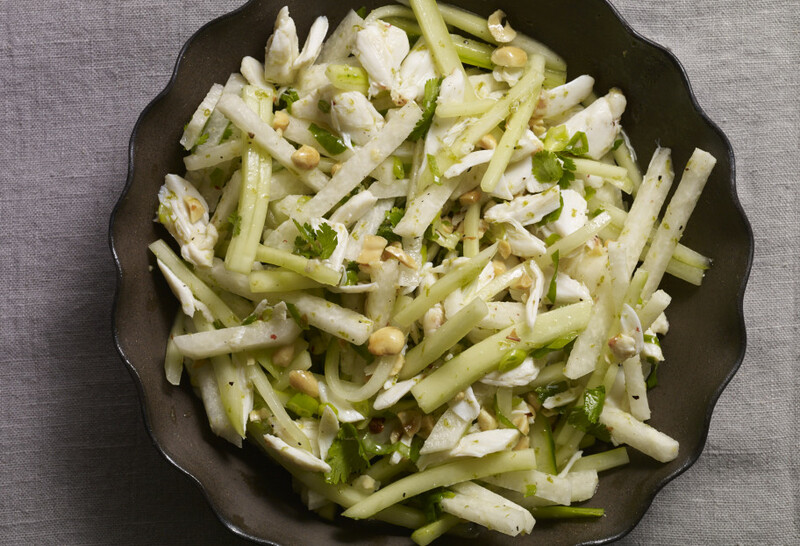 Add the jícama, cucumber, scallions, peanuts and cilantro and toss well to combine. Then, add the crab and gently toss, taking care not to break up the crab meat. Serve over lettuce or in individual cups accompanied by tostadas or crackers. Delicious every time! Tastes like the beach and summer. I love your description, Carol…thank you. Love, love, love your show!!! I just madeyour crab salad with jícama, súper deliciosa! !, muchas gracias!!!?? Me encanta tu programa! I watch it with my little girls and they get excited to go to the kitchen and try out your recipes. Muchisimas gracias! Gracias! You will have to let me know what you try!! I’m making this over this weekend! Yay, Louise!! Hope you enjoy! Hi Pati – love your show! Made the Crab, Cucumber and Jícama Salad and it was a hit! Next up is the Beef Barbacoa Sliders. You are awesome! Thank you! This was excellent, it was the first time trying Jicama and it was delicious. The only thing I did differentlywas to add a teaspoon of sesame toasted oil… It felt like the right thing to do because of the rice wine vinegar. Yay!! Thank you so much for trying it! Delighted you tried it and liked it, Mary!